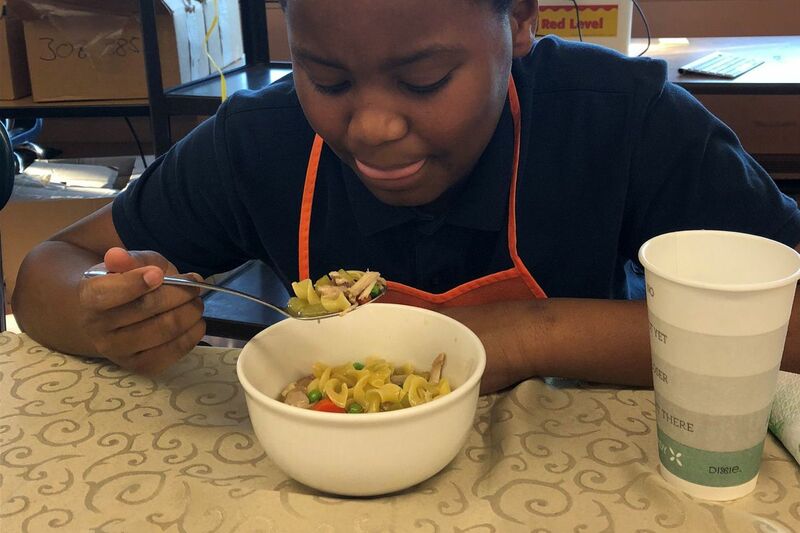 Omar Drinkard enjoys his first taste of the chicken noodle soup that he and other students learned to make during week 2 of the spring 2019 My Daughter's Kitchen cooking program at Wiggins School. Vincent Vadeanu, Sophia Heavens, CJ Williams, Laziz Davronov and Hamza Alnatsheh try the chicken noodle soup that they learned to make during week 2 of the spring 2019 session of My Daughter's Kitchen at Loesche. Good thing that we prepared for our first storm by changing our Wednesday class to Thursday. We had Vincent Vadeanu, Sophia Heavens, Laziz Davronov, Hamza Alnatsheh and CJ, our sub show up. Everyone was ready for chicken noodle soup, except Sophia, who told us she never eats soup. We talked about the importance of reading the whole recipe ahead of time so you know how to plan. This allowed us to begin browning the chicken, because it would take 30-40 minutes to cook. While the soup was cooking, we learned that “mise en place” means “everything in its place” and why this is so important in cooking. Jane Pupis, a retired 4th grade teacher, quizzed the students on the boiling and freezing points of water. Surprisingly, they didn’t know that water boils at 212 degrees and freezes at 32 degrees. Seemed like the students’ favorite part was deboning the chicken thighs. “This smells so good,” said Vincent. We gathered enough for the soup and they “finished” the meat on the bones. “Oh, this tastes so good,” sighed Laziz. We sat down to eat at our correctly set table with a group of very happy chefs. Even Sophia liked the soup. Vincent commented, “I like it except for the peas.” Luckily, we brought some containers so everyone got some to take home. Bayard Taylor chef Bryttanye Vasquez demonstrates good chopping form for classmate Jayden Murphy as they prepare the carrots and celery for chicken noodle soup with vegetables. Soup is one of the most flexible foods you can make. You can use fresh ingredients or leftovers, make it spicy or mild, use a creamy stock or clear. Our second-week class was perfectly timed for learning about soup, because the kids had had a snow day, and soup is a great winter meal. Rescheduling our Wednesday class left us shorthanded, but Jayden Murphy and Bryttanye Vasquez more than made up for it. With speed and skill, they did the work of five students — and proved themselves Super Soup Chefs in the process. To start, we talked about why we would want to make soup from scratch, and Jayden hit the nail on the head noting that it was “because of the healthy things” you gain from a homemade recipe — fresh ingredients and far less salt than you get in canned soup. We also discussed how soup is an easy, cheap meal for feeding a family. The chicken in our recipe cost less than $4 and the entire meal was less than $13 for a family of six. Hillary Gaye tries the chicken noodle soup with vegetables that she and other Philadelphia Montessori Charter School students learned to make during week 2 of the spring 2019 My Daughter's Kitchen cooking program. The students were surprised how easy it was to make soup that tasted better than a canned soup. We talked about all the things that they could add to the basis soup recipe. Students at Wissahickon Fernhill learned to make chicken noodle soup during week 2 of the spring 2019 My Daughter's Kitchen cooking program. We loved this dish, and even added extra noodles because everyone was so hungry. The recipe was easy, and the kids loved chopping and mixing all the ingredients together. We decided it would be a fun meal to make if someone in your family wasn’t feeling well. All of the kids felt they would be able to follow the recipe on their own! LaSalle Academy students prepare chicken noodle soup with vegetables during week 2 of the spring 2019 My Daughter's Kitchen cooking program at the school. With this week’s recipe, the children’s chopping skills were definitely getting better. I asked Allanah Bumpers if she felt more comfortable chopping this week than last week. But she was working on the biscuits last week, so this was her first time chopping vegetables. Well, you wouldn’t have known it, because everything was uniform and cooked evenly, and the vegetables in the soup were soft and tender. Kiany Varela and Khaliyl Ali did a great job manning the stove. The final verdict on the soup was probably a 6 out of 10. They didn’t think it had enough seasoning, but we explained that with this kind of recipe, you are able to season it to your liking but it’s best to taste it first. Patrick Brown-Edwards, Joeliz Vasquez, and Joel Vasquez place the vegetables in the soup pot during week 2 of the spring 2019 My Daughter's Kitchen cooking program at McClure. This week was a very exciting week at McClure. We had another student join our class, and we had several absent this week. The students this week was very happy and excited to cut the vegetables. One student claimed that the reason that his mom wanted him to try My Daughter’s Kitchen was so that he could try to eat more vegetables and eat healthier. Overall the chicken soup was a great success. We all had plenty left over to be able to take some home. The students are looking forward to trying next week’s dish. Omar Drinkard, volunteer Annamiek Van Laar, and Tyrone Baker prepare the garlic for chicken noodle soup during week 2 of the spring 2019 My Daughter's Kitchen cooking program at Wiggins School. Eliany Chavarria said she saw her mom make soup once, but none of our students ever made soup from scratch themselves. Some said they rarely even eat soup. It wasn’t long before the comforting smell and savory taste of our chicken noodle soup was winning them over. The students even started making creative suggestions, like adding kale, tomatoes, peppers, and potatoes, to make the soup more to their liking. There may be some more soup pots on the stove in Camden this weekend! Such fun to take a chickenâ€™s temperature! Lealin Mas, Layla Centano, and Yaslyn Garcia make sure the chicken is cooked all the way through before it is added to chicken noodle soup. Since our first week’s class was cancelled due to weather, we decided to jump right in and make soup and biscuits for our first time together. Enthusiasm, energy and positive attitudes made the time fly and the soup and biscuits come together quickly. Our students commented, “I learned to cook and it’s fun. I learned that I love chicken soup! My favorite part was cutting the food.” It was a wonderful beginning to the semester. Kaylie Cafferty, Amera Sirleaf, and Lorianna Gil-Lalondriz prepare ingredients for chicken noodle soup during the second week of the spring 2019 My Daughter's Kitchen cooking program at Robert B. Pollock Elementary School. My students were surprised that we were going to make the broth ourselves instead of getting it from a box or can. As we were preparing our ingredients, Julian Lebron, 5th Grade, asked, “Wait, where’s the broth?” The students enjoyed the process from start to finish; learning to brown the chicken, cut the vegetables, and skin the meat. Xavier Figueroa carefully measures the liquid for the chicken noodle soup during week two of the spring 2019 My Daughter's Kitchen cooking program at Hunter. Daquan Davis, Marialis Rodriguez, Jayla Velazquez, and Rosary Torres try the chicken noodle soup that they learned to make during My Daughter's Kitchen cooking class at Feltonville School of Arts and Sciences.